ABOVE: The Basilica dei Santi Maria e Donato and its bell tower. Nearly all of Murano's churches were torn down and replaced by housing or glass factories during the French and Austrian occupations (1797-1866). Today, only four churches remain, and two are open to visitors. The Basilica dei Santi Maria e Donato is the island's top sightseeing attraction, and it's one of the oldest and most interesting churches in the Venetian Lagoon. The Venetian Byzantine building is deceptively simple in outward appearance, except for the colonnaded apse facing the Canale San Donato. Inside is a different story: The richly-decorated interior has a lovely marble-and-mosaic floor that was laid in 1141, around the same time as the similar floor in Venice's Basilica di San Marco. Another key architectural feature is the mosaic dome in the apse, which dates to the 12th Century and shows the Virgin Mary against a simple gold background. The bell tower (see top photo) is separate from the church. Visiting hours are 8-12 and 4-7 Monday through Saturday and 3:30-7 p.m. on Sundays. 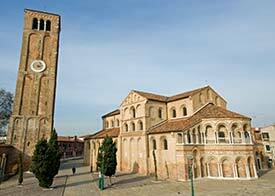 The basilica is on the Campo San Donato, just up the canal from the Museo Vetrario (Glass Museum). Murano's other important church is the Chiesa di San Pietro Martire, on the Campiello Michieli across from the Campo Santo Stefano in the middle of the island (just south of the bridge across Murano's main canal). The church was first built in 1437, reconstructed in 1509 after a fire, and decorated with paintings by artists such as Veronese, Giovanni Bellini, Bartolomeo Letterini, and Domenico and Jacopo Tintoretto. San Pietro Martire isn't nearly is pretty as Santi Maria e Donato, but it's worth a walk-through, and you can visit the adjacent sacristy and museum if you're a fan of church and human relics. You'll see a handful of other ancient palazzi and houses as you explore the island, along with plenty of brick glass factories and other industrial buildings from the 19th Century.